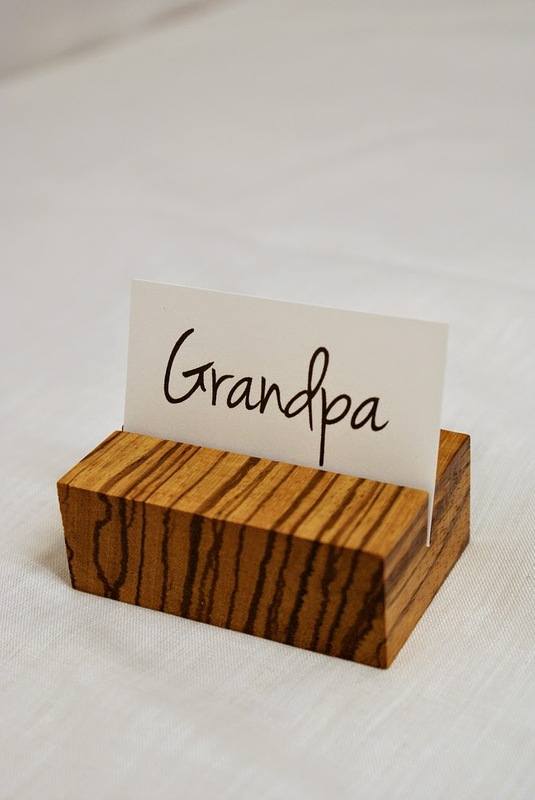 Place card holders are a great way to make dinner parties and gatherings feel extra special. 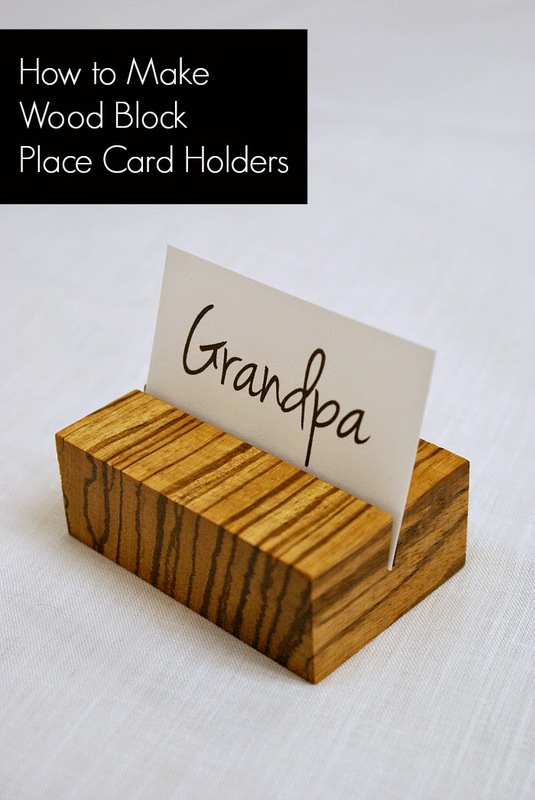 These wooden place card holders could also be used for displaying business cards, notes or photos! For this project, we used zebra wood from the scrap bin at a local woodworking shop. It was fun to search through the pieces and admire the beautiful colors and grains. I had no idea there were so many different woods - or how spendy some can be! These scraps, however, only set us back about fifteen dollars. First, measure and mark a line at one inch and two inches. This photo is a little off because I thought we would measure down the whole piece in one go. However, as Jesse explained, you need to measure and cut each piece individually because the saw blade takes off a teeny chunk that will affect your measurements. Next, use a scribe to cut a small groove along your measurement line. This will help the saw blade get started. We used a hand saw for this tutorial because I figured not everyone has access to power tools or feels comfortable with them. However, Jesse finished the batch using a table saw. After your grooves are made, secure the block in place by clamping it to a table or work bench and using a bench hook. Then use an angled block as a guide to make the center cut, stopping about half way though the wood. Slide the piece forward, re-clamp and make the second cut all the way through the wood. Once all the pieces are cut, the last few steps are a breeze. Use extra fine sand paper to smooth the sides and edges. A trick Jesse showed me was to lay the sandpaper flat and rub the block in a circular motion on the paper. Remove all the dust with a tack cloth and wipe on two coats of clear polycrylic, allowing for drying time between. I also gave my blocks a final sanding with some finish grade sand paper.